People in Afghanistan are hopeful these days, reports Anne Brodsky , author of the new book, With All Our Strength:The Revolutionary Association of the Women of Afghanistan. Afghans are repainting their houses, getting new furniture, putting flowers in a vase. Then they shrug and say, "If they start bombing again, it will all be ruined." Their hopefulness is more a testimony to their incredible spirit than to real improvements in their situation. Brodsky, who is an assistant professor of psychology and women's studies at the University of Maryland, Baltimore County was dishearted on her recent trip to see so few improvements since the year before. Northern Alliance warlords continue to maintain a state of siege. "People are saying, what's the US thinking? Why would they return these criminals to power? It's a recipe for another 9-11." These are the men who destroyed the country from '92-'96; the Taliban was just the next generation of fundamentalist tyrants. Because of conflicts between the warlords, especially in Masar-e-sharif, the only thing holding the country together is the UN peacekeeping force, and it is small. For women, the situation has improved only slightly. Last year, 95% of the women in Kabul wore the burkha. Now perhaps 65-70% still wear it. "So there's a little more personal choice, but most women are still so concerned about the risks of harassment, the risks of kidnapping and forced marriages, that they feel safer wearing the burkha," Brodsky said in our phone interview. Parents are so fearful that many will still not allow their girls to leave home to go to school. Reconstruction during the past year has been minimal. Some roads have been rebuilt -- "they're doing it as quickly as possible -- the new roads aren't paved but the holes aren't as big." The avenue leading to the palace ruins, which used to be lined with big trees, has been replanted with saplings -- but they are dying because there's no water! One man told Brodsky, "The international community is coming in here and trying to change the color of one leaf, when the roots need to be watered and fertilized." Where improvements have been made, "the branding is amazing. You'll see a little bridge over a two foot gulley with a huge sign almost as big as the bridge saying, Donated by the government of Germany." Reconstruction seems to consist largely of commercial buildings. A Commercial Center of Kabul is in the works, with a mall, apartments and a movie theatre, but meanwhile rents in the city are incredibly high, electricity is sporadic and water is contaminated. "At the home of a doctor I visited, they had a horrendous pit toilet four feet above the street that was dropping directly onto the street. Fourteen children and eight adults were using that toilet. And there was no running water to keep it clean. Their shallow well was bringing up water so contaminated, they couldn't wash clothes in it. "The basic needs for sanitation, peace and security, jobs, are not being met.Rents in Kabul are astronomical. A small residence on the outskirts without electricity or sanitation may cost $100 a month -- roughly four months salary. Refugees are still living in three-walled vending stalls, but now instead of cloth tarps over the opening, they have plastic tent tarps. A private company has begun to restore phone service but at 10 cents a minute, phone calls are exorbitant for teachers and civil servants who make about $30 a month. If they get paid. Many teachers have not been paid for months. They keep teaching because they are committed to keeping the schools open but recently they threatened to strike. The strike was temporarily averted when an NGO offered to provide salaries for two months. "All of our taxi drivers were college educated," Brodsky adds, indicating how difficult is the situation of professionals and government workers. "Lots of people are begging, and there's tons of child labor everywhere. Pakistan is looking pretty progressive next to Afganistan now." In businesses run by internationals, everyone is seeing an enormous pay differential between Afghan workers and foreign workers. In an engineering firm, for example, foreigners will earn from $5,000 to $15,000 a month, while locals are paid $1500-$2000. The discrepancy is causing a lot of resentment. Because NGOs are willing to pay high rents, they displace families who cannot afford to pay them. NGOs also pay their workers well, and spend so much money for their land rover, phone service, rent, and security that people wonder whether there's anything left for the services these organizations are there to provide. Backyard literacy classes for girls are still a necessary service provided by RAWA in Jalalabad. Even though government schools have opened, these girls do not have the permission of their families to attend school. But because RAWA has been running underground classes like these throughout the Taliban era, the families do trust RAWA teachers to provide their girls with education. The girls are still hopeful that one day they can convince their families to send them to regular school. "I talked to the Women's Minister, Habiba Sorabi. Her comment was that the drafting committee was fairly well organized but she thought this part of the process was quite lacking. "I was very distressed. It really is not something you want to call liberation, democracy, peace and freedom. "No doubt this would be a long process after 24 years of war but what's being done in our name is very superficial. "It's like what we're hearing about the book. We've already covered Afghanistan, editors tell us, so now we can go on to something else." Perhaps saddest of all is the situation of RAWA members who are now returning to their former homes. So many people have left, and there are so many divisions between people after years of war, that the old community, and the trust that existed there, has been broken. RAWA continues its work. The hospital in Islamabad is still open. Mobile health teams travel through Afghanistan. And lots of schools and educational programs are operated. "The thirst for knowledge is amazing," said Brodsky. 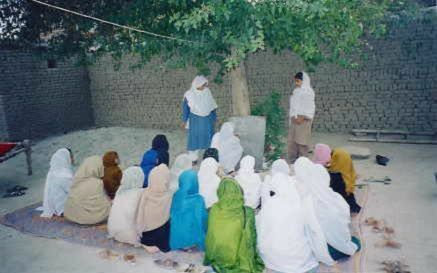 In many cases, in Jalalabad for example, girls are still not allowed to go out to school, so the educational center there is educating more boys than girls and women. "They talk about women's rights to them and that affects the family." Backyard classes are still held for girls who are not allowed to go outside. But if girls do go out and talk to someone who is not a relative, there are still virginity checks. With All Our Strength:The Revolutionary Association of the Women of Afghanistan by Anne E. Brodsky is published by Routledge (USA) and may be ordered from Powell's or from Amazon.